Water losses in drinking water utilities occur as two distinct types: real losses are the physical losses from distribution systems, mostly leakage but also water lost from tank overflows. Apparent losses are the nonphysical losses that occur when water is successfully delivered to the customer but, for various reasons, is not measured or recorded accurately, thereby inducing a degree of error in the amount of customer consumption. When such errors occur systematically in an appreciable number of customer accounts, the aggregate measure of water consumption can be greatly distorted and significant billings can be missed. This chapter explains the causes of apparent losses and describes the significant impacts that they exert on consumption data integrity and revenue capture potential in systems with metered customers. Chapters. 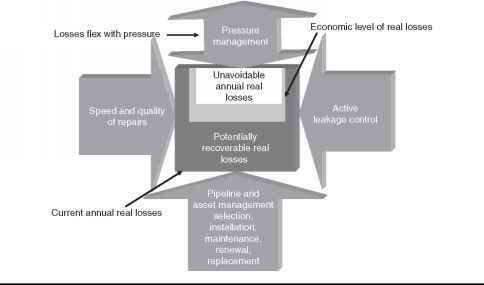 12 to 15 explain the major categories of apparent loss and the means to control these losses to economic levels. Certain occurrences of apparent losses are easily identified; and assumptions can be made to initially approximate the more complex components of apparent losses. Ultimately, detailed components should be verified as bottom-up work (field investigations) is conducted and the water loss control strategy develops.